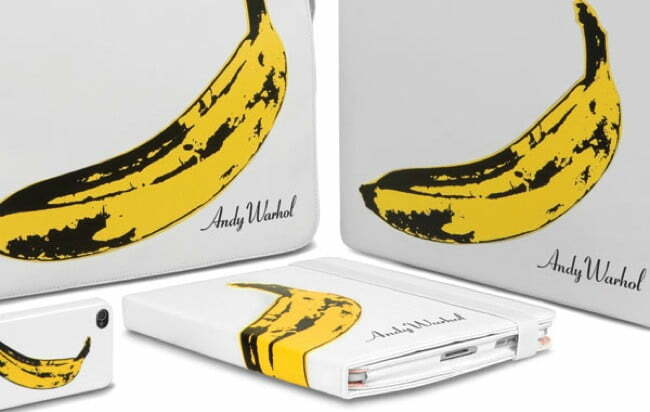 On Tuesday, Incase revealed its collaboration with The Andy Warhol Foundation for the Visual Arts, which has resulted in colorful Warhol prints covering various cases and bags for the iPhone 4, iPad, and MacBook. Warhol’s famous Camouflage and Banana prints from the 60s cover the company’s snap-on iPhone 4 case, iPad 2 book jacket, iPad 2-friendly shoulder bag, and protective MacBook sleeves. Various prints, including a bright cow portrait, are featured on some of the other products. The full range of designs from the Incase for Andy Warhol collection can be seen in the line of cases for the iPhone 4 (above, $50 each). None of the prints are for the faint of heart, but diehard Warhol fans and color enthusiasts will be excited to wrap their Apple products in such a bright and fun collection. On Wednesday April 6, The Andy Warhol Foundation for the Visual Arts will host an event in New York to celebrate the new collection. The event will include showcases of the collection as well as interactive art pieces that focus on the connection between art and technology. The entire event will be filmed on an iPhone 4 to be viewed live at goincase.com. Select products from the new collection are available for purchase as of today, while others will be coming soon or are available for pre-order. The products will also be available through the Apple store and its retail locations.